It’s often said that the kitchen is the heart of the home... a gathering place for family and friends to spend time enjoying each other’s company, cooking, eating and catching up on the events of our days. Since the kitchen is one of the rooms where so much quality time is spent every day, making it as inviting as possible is most homeowner’s top priority. Making your dream kitchen a reality can be costly, time consuming and complex if you don’t know where to start with your kitchen remodelling in NJ. 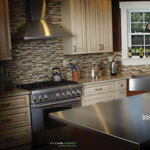 As a top-rated, solid wood RTA kitchen cabinets supplier with years of experience helping customers around the country, we have the expertise to help you measure, design, and fit the perfect kitchen for your living space – turning your house into a home, while also increasing its market value. Here at Kitchen Cabinet Warehouse we have the answer to all your kitchen questions, and we aim to make your home improvements as easy as possible. With a simple ordering process, more than 500,000 items in stock and fast delivery, we are your number one choice for affordable RTA kitchen cabinets and New Jersey kitchen remodelling. Specializing in ready to assemble, solid wood kitchen cabinets we ensure you receive nothing but the best quality and service, with some of the lowest prices on the market – guaranteed. Whether you are looking for a traditional shaker-style kitchen, a modern white finish or a country classic maple look, we can help you find the perfect, affordable RTA Kitchen Cabinets. There are many benefits of buying RTA kitchen cabinets from the team here at Kitchen Cabinet Warehouse, including our free design services, quick shipping, and extensive stock selection. We also ensure a 100% Satisfaction Guarantee, so it’s not just our low prices that will leave you impressed! Are you a contractor? Well, you’ve come to the right place. As one of the largest suppliers of RTA kitchen cabinets in the United States, we have access to a huge inventory and we pass those savings directly onto you. Make sure to check out our special discounts for builders and contractors today.